Base oil is widely used as a raw material for the production of lubricants. The composition of base oil and its additives varies depending upon application. Rapid industrialization is one of the key factors driving the global base oil market. In addition to this, rise in sales of vehicles and increase in logistics and trade play a significant role in boosting the base oil market. Growth in the global automotive sector and increase in number of manufacturing plants is anticipated to propel the global base oil market. As per a market report by Transparency Market Research, the global base oil market was recorded at US$ 33.2 bn in 2017. The market is projected to expand at steady CAGR of 1.7% during the forecast period that is from 2018 to 2026. The global base oil market is classified on the basis of type and application. In terms of grade, the global base oil market is classified on the basis of group I, group II, group III, group IV, group V, re-refined, and naphthenic. The group I segment can be further sub-segmented into SN500, BS150, SN150, SN250, and others. Similarly, the group II segment can be sub-segmented into N600, N250, N150, N500, and others. The group III segment can be sub-segmented 8cSt, 2cSt, 2cSt, 4cSt, and 6cSt. The naphthenic segment has been further divided into 400-800 SUS, 80-130 SUS, 35-60 SUS, 200-300 SUS, and above 1200 SUS. It has been noticed that the group I is likely to lose its market share to group II and group III. This is mainly because of the stringent regulations by the government to reduce vehicle emission. Group II and group III consist of higher level of base oil composition. Thus resulting in lesser vehicle emissions. In terms of application, the global base oil market is classified into process oils, industrial oils, hydraulic oils, automotive fluids, metalworking fluids, and others (including rust prevention oils, greases, and marine lubricants). Among them, automotive fluids are anticipated to lead the base oil market. This is mainly because of the increase in number of vehicles across the globe. In terms of region, the global base oil market has been divided into North America, Europe, Asia Pacific, Middle East & Africa, and Latin America. Among all of them, Asia Pacific held more than 40% share of the global base oil market in 2017. The region is likely to display impressive growth in the near future as well. This is mainly because of the increasing number of end-use industries in the region. 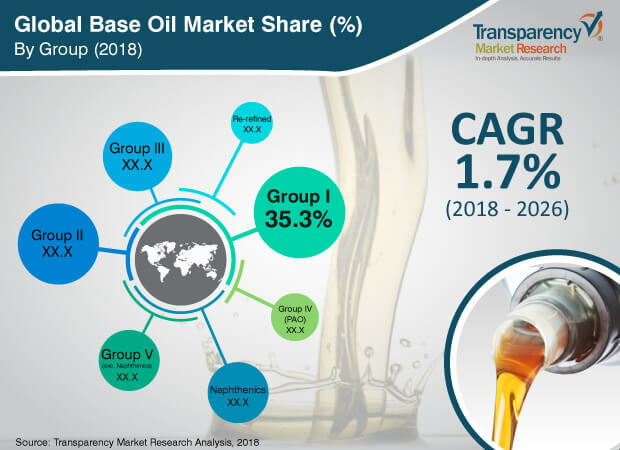 The base oil market in North America is projected to expand at a CAGR of 0.9% from 2018 to 2026. On the other hand, growing automotive sector in Europe is likely to have a positive influence on the growth of base oil market. Some of the leading players operating in the global base oil market are Nynas AB, PetroChina Company Limited, ExxonMobil Corporation, GS Caltex Corporation, The Phillips 66 Company, SK Lubricants Co. Ltd, and British Petroleum. The report analyzes the global base oil market for the period from 2017 to 2026, wherein 2017 is considered the base year and the period from 2018 to 2026 the forecast period. Data for 2017 has been included as historical information. The report covers all trends prevalent in the global base oil market. It also highlights various drivers, restraints, and opportunities expected to influence the market during the forecast period. The study provides a holistic perspective of the market in terms of revenue estimates (in US$ Mn) across different geographies including North America, Europe, Asia Pacific, Middle East & Africa, and Latin America. The report provides cross-sectional analysis of the global base oil market, in terms of market estimates and forecasts, for all segments across different regions. The research report provides in-depth analysis of the global base oil market based on group, application, and geography. The report also includes competitive profiling of major players engaged in providing base oil. Major business strategies adopted by these players, their market position, and various recent developments have also been mentioned in this research report. The report offers market positioning analysis of key players operating in the global base oil market. The research study on the global base oil market provides detailed analysis of various groups and applications. These factors enable the analysis of various trends that would impact the market from 2018 to 2026. The report comprises a comprehensive coverage of the underlying economic and technological factors impacting the base oil market. The market positioning analysis of key players throws light on the competition prevalent in the market. Different factors that affect the base oil market positively as well as negatively have been identified in this report. The report aims to provide comprehensive cross-sectional analysis of the base oil market across geographies including North America, Europe, Asia Pacific, Middle East & Africa, and Latin America. Additionally, it highlights competition landscape of the base oil market and identifies business strategies adopted by leading players. Under the company profiles section, the report provides an overview of companies operating in the market, strategies deployed by them to gain a competitive advantage, SWOT analysis, annual revenue generated by them in the last five years, and recent developments. Key market players profiled in the research study include Royal Dutch Shell Plc, Nynas AB, China Petrochemical Corporation, ExxonMobil Corporation, PetroChina Company Limited, GS Caltex Corporation, The Phillips 66 Company, SK Lubricants Co. Ltd, British Petroleum, and Chevron Corporation.